My latest LibriVox recording is out! Rainbow Valley is the sixth book in the Anne of Green Gables series. In this book, the narrative switches from Anne to her children and their friends the Merediths. This is my last Anne book to record for LibriVox, since the remaining Anne books are, unfortunately, still in copyright in the US. My latest LibriVox audiobook has just been published. Ten From Infinity is a Science Fiction novel by Paul W. Fairman. LibriVox audiobooks are free recordings of public domain publications. It began when a pedestrian got hit by a cab in New York City. No doubt it was the only motor mishap in the history of creation that reached out among the stars—for far out in space a signal was registered: Something has gone wrong…. And something had gone wrong, for the doctors discovered their accident patient had two hearts. It was the beginning of the discovery that the Earth had been invaded by 10 such creatures from Outer Space. Every effort was made to learn their purpose. An orbital flight was launched to spot alien bodies—only to be destroyed in space. One of the alien men was captured—but no threat of pain or death could unlock the secret in his brain. Something had gone wrong. And somehow, some way had to be found to make it right—before the threat of danger overwhelmed all mankind. The Voyages of Doctor Dolittle is now up on LibriVox. Had to do a lot more editing on this one to get it to match the PD gutenberg.org text; it has a lot more “great white hope” stuff that’s offensive to modern sensibilities, that had been edited out of the text I originally recorded. Author kruthie73Posted on Monday, 14 October, 2013 Wednesday, 26 October, 2016 Categories audiobooks, librivox, public domainTags audio, audiobook, audiobooks, librivox2 Comments on More Dolittle! I recently recorded the two Doctor Dolittle books for The Sound Way. These books will only be available through their program, but, after a bit of editing to make sure I was using a completely public domain version, I have released the first of the two books on LibriVox: The Story of Doctor Dolittle by Hugh Lofting. Book 2 coming up shortly. Today, many websites around the Internet have “gone dark” to protest against, and raise awareness about some very important proposed legislation in the United States, which could fundamentally alter how the Internet operates: House Bill 3261, The Stop Online Piracy Act (SOPA) and S.968, the PROTECT IP Act (PIPA). Archive.org (where LibriVox hosts its audio), is going dark from 6:00 am – 6:00 pm PST on Wednesday January 18 (9:00 am – 9:00 pm EST – 14:00 – 02:00 GMT) as part of this important protest. This means that the LibriVox catalog will not be accessible during this time. Legislation such as SOPA and PIPA directly affects libraries (pdf) such as the Internet Archive — and indeed LibriVox — which collect, preserve, and offer access to cultural materials. Furthermore, these laws can negatively affect the ecosystem of web publishing that led to the emergence of the LibriVox. These bills would encourage the development of blacklists to censor sites with little recourse or due process. The Internet Archive (and with it LibriVox audio files) are already blacklisted in China. There are real concerns that this legislation could lead to similar blacklists in the United States. For United States residents, please inform yourself of these issues, and if you think they are important, please take action. For non-US residents: Sorry for dragging you into this, and if you are willing, you might wish to sign a petition to the State Department to express your concern. You can visit AmericanCensorship.org for instructions on contacting your senator. The third Valonia book is finally officially published on Iambik (yay!). No word yet when we’ll get access to the last book in the series. I was offered another series via ACX called the Summer Chronicles. I finished the first of those, Phantom Universe just last week. It’s currently in post-processing. The second, Forsaken Harbor, is due to be published at the end of this month, so I guess I’ll get to start working on it some time after that. I finished my latest project for Ignatius, Poor Banished Children, back in August, but my contact had some vacation time, so I haven’t heard when it’s due to be published. I’ve been offered a novella called Song at the Scaffold to read next. It’s set during the Reign of Terror. Should be interesting. I’ve lots of knitting updates too, but I’ll keep those for a separate post, or this will be enormous. Just two more weeks of rehearsals for My Fair Lady. I’m feeling pretty confident at this point; nowhere near as panicky as in past musicals (so far I’ve only woken up with a start at 4am once). The set is pretty much complete (it helps that it was a nice, simple one); most people are off-book; props are pretty much done; I haven’t been paying much attention to costumes, as I already have mine, but hopefully they’re close to done too. I’ve recently finished three more audiobooks. I just finished Sense and Sensibility for LibriVox. I finished a critical edition of Mansfield Park for Ignatius about two months ago, but my contact was on maternity leave, so it’s only just been published. I also published the main text of it (with a bit of editing to make sure it conformed to the absolutely-for-sure-public-domain version on gutenberg) on LV. And I’ve just finished the second book in the Chronicles of Valonia series for Iambik. The first two books in the series (The Jewels of Valonia and The Golden Casket and the Spectres of Light) will be released in Iambik’s first SciFi collection. Will post a link once the collection is published. I’ve started working on Poor Banished Children now; and I’m about a third of the way through my SFFAudio challenge book, The Big Time. I’ve also picked up my poor, neglected Spanish solo, Angelina, again. And now that I’ve started reading it again, I’ve remembered why I lost interest in the first place. Although the story is interesting so far, the author doesn’t seem to have ever heard of the rule in writing, “don’t use a big word when a simple one will do”. His prose is flowery, verbose, long-winded, and simply not meant to be read aloud. He gives me fifty fits every time I sit down to read a chapter. He also spends a lot of time in long descriptions of places and events that have nothing to do with the plot (JRR Tolkien has nothing on this guy). I have a couple of minutes before my meeting begins, so this seems as good a time as any to update here. I’ve been working on Little Shop of Horrors for the past few weeks in the ensemble. We open a week from Friday. It’s been interesting… we rented a set of puppets from somewhere or other, but when they showed up, they were in pretty bad condition. The director ended up going to Louisiana to rent another set, only he didn’t have room in his vehicle for the largest, so we’re still having to fix up the largest of the other set (and try to make it look sort of like the other set). Other than that, it’s been quite fun. It’s a small cast, fifteen people, and the youngest person is 19 (a great relief after the huge number of teenagers in Brigadoon); everyone sings well, can do harmony, acts decently. All in all, a really nice group, and at least half are new to the theatre, which is always fun too. Finished the two Montfort books for Catholic Audio Company, and am close to finishing Death of a Pope for Ignatius, and not too far off on the two for iPublish. Have been neglecting Secret Garden dreadfully, but after next week, I’ll have my evenings free again and will be able to record more. I’ve also been working on a sound booth, because since the weather got hot, I’ve pretty much been limited to recording first thing in the morning, because the crickets and cicadas are so loud. I build a cage out of half inch pvc pipe. It’s tall enough in the centre that I can stand up straight. I bought a set of sound absorption sheets from Audimute to cover it with. I’ve attached two lengthwise along the sides with gromets and one inch binder rings. I’ve started attaching a third sheet to the top. I had originally planned to just hang the fourth sheet over the front opening, but quickly decided that wasn’t going to be effective, so I’ve decided to build a door and attach the fourth sheet to it with the gromets and book rings like the rest of it. That leaves a section on the back wall between the roof and the top of the other sheets. I’m planning on attaching a couple of acoustic tiles that I had for the portable sound booth to a piece of muslin and hanging that over that hole. Once it’s complete, I’m going to move the mic in there, along with a secondary monitor, keyboard and mouse so that I can continue to read off the screen, but without having to worry about laptop fan noise (and without having to move the laptop back and forth, which gets pretty old when you have as many things plugged into it as I do). I forgot to take pics of the work in progress, but I’m planning on taking some as I build the door, and then of the completed booth. Betty Buckley is coming to the Hip this Saturday, and I’ve bought two tickets to the show. I’ve invited Regan to go with me, since she’s a big fan of the Mystery of Edwin Drood in which BB played the title role. It’s my birthday present to myself, and I had to do some wangling to be excused from rehearsal the Saturday before opening night (but I made sure to wangle before buying the tickets, just in case). I originally had this in my last post, but I decided to separate it out and leave the Star Trek review in its own spoilery post. I managed to record eight chapters for my Clara Vaughan project this weekend (it had been on hold for a while while I finished the Interior Castle, did Brigadoon, and then bought and set up a new laptop after my old one died). I’ll be working more steadily on this one as it’s due mid-June and I’m not quite half-way yet. I may be doing another project for Catholic Audio Company (the people I did Interior Castle for), a two parter by St Louis de Montford, True Devotion to Mary and the Secret of the Rosary. I haven’t signed a contract for this one yet. My three LibriVox projects have been sorely neglected for the past few weeks. I’ve been watching Rosemary and Thyme via Netflix. I’ve been a fan of Felicity Kendall’s since I came across her as Viola/Cesario in the BBC’s Twelfth Night back when I was an undergrad, and after she appeared on an episode of Doctor Who, I saw that she’d done this murder mystery series a few years ago and decided to check it out. I’ve also been meaning to watch the Good Life (aka Good Neighbors in the US) because although it comes on PBS every so often, it’s quite sporadic, and I’ve never figured out the schedule. 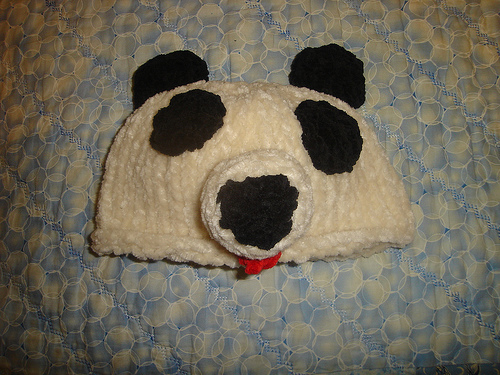 I’ve started working on baby projects for T. I’ve already made a little panda hat. I still need to buy eyes for it, but otherwise it’s finished. The other project is going to be a pullover with a train on it. I found a pattern, and I’m going to change up the colours to make it look like the Hogwarts Express. I had ordered the pattern a couple of weeks ago, but they had run out, and I had to wait for their new stock to come in. It finally arrived at the end of last week. Now I just need some yarn – I have some in my stash that I want to use, in red, black, white, and yellow, but I also need some grey, blue and green. The melodrama goes up in less than two weeks. I’m not particularly excited at this point, but then, I hadn’t wanted to direct to begin with. I wanted to be nice and rested when auditions for Children of Eden came along. Ah, well. We do get to use the theatre space as of tonight, which is a week earlier than we’d expected, so that’s nice. Even though we don’t get to do any set building as yet (the Children’s Theatre are still officially in the space), at least the actors will get a feel for the dimensions and the acoustics. I went downtown to watch the fireworks last Friday for the first time since coming to live in Waco. The closest I’d come to this before was hanging out with friends in one of the Baylor parking lots when I was an undergrad and setting off some of our own little ground based fireworks and then watching the big display from a distance. It was quite fun. I hung out with Beth and the 92.9 tent; and Eileen came and hung out with us too. I’ve just started working on Anne of the Island for LibriVox. I had been working on Mr Hogarth’s Will and Angelina, but I just couldn’t get into them and I kept procrastinating and not doing any recording at all. I’ve turned Mr Hogarth’s Will into a collaborative, and started up Anne as my new English solo. I feel sort of guilty abandoning Hogarth, especially because no one has shown any interest in it in the nearly two weeks since I turned it collaborative. But I’ve also started recording more often now that I’m working on a project that interests me. If no one picks up any of the chapters, I’ll probably do one here and there just to keep it alive. Oh, and for the first time since, I think, my second project, someone beat Ans to signing up to PL one of my English solo projects! I’m still working on Angelina too (more enthusiastically since I started Anne). Spanish is so under-represented in the catalog, that I feel it’s my duty to contribute as much as possible, both in solos and collaboratives. I’ve currently got three collaborative projects going – part 6 of Aesop’s Fables, Jose Martí‘s La Edad de Oro, and I took over part 2 of Don Quijote from Gesine when she needed some time off. Angelina is only the third solo Spanish work in the catalog, and one of the other two is mine as well.